Ambos corporate partner Christina Trappeniers gives her take on the current Belgian M&A market in a dubbelinterview together with Piet Bevernage (Ackermans & van Haaren) and Filip Lacquet (PMV - Doe- en Durfbedrijf) for CFO Magazine. Click here to read the interview (in Dutch). 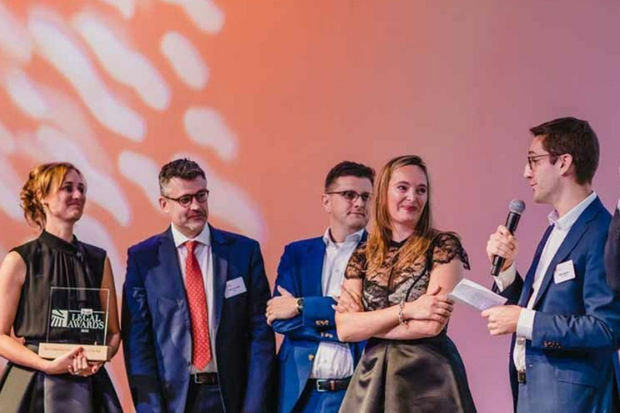 Ambos voted "Best Independent Belgian Law Firm"
Ambos assisted the shareholders of Marine Inspection Operating Services (MIOS) BVBA in the successful sale of their shares in the company to Camin Cargo Control Inc., an American company specialized in marine inspection services. Marine Inspection Operating Services BVBA is a leading company in the conduct of tests, inspections, laboratory tests and the treatment of blends and additives for the marine sector in Antwerp, Amsterdam and Rotterdam. Ambos assisted Sufina, a private equity holding, in the acquisition of a majority stake in De Groote Gaston and De Groote Deinze. De Groote Gaston and De Groote Deinze are Flanders' leading road marking companies with a remarkable client portfolio and annual turn-over. Through the participation of several De Groote family members, the two companies are brought together again after a half century of separation. Ambos NBGO assisted the independent Belgian private equity fund KeBeK II with its acquisition of Creaplan NV, Belgian market leader in fairs, displays and interiors. Entrepreneur Walter Mastelinck, known from Transics, is the new CEO of Creaplan. Founders Ann Vancoillie and Dirk Deleu remain closely involved in Creaplan as co-investors. Ambos assisted Sufina, a venture capital & private equity fund, on the one hand, and Xavier Costenoble, CEO of the Winsol Group, on the other hand, in the management buyout of the Winsol Group from Bencis Buy Out Fund II A and B, investment funds. The deal was partially financed by PMV. Ambos also assisted the buyers in the negotiations regarding the mezzanine financing. Ambos NBGO assisted Senior Assist NV in the successful sale of 6 nursing and care homes and 2 assisted-living facilities to Senior Living Group NV, the Belgian branch of the French listed company Korian. Senior Assist NV is a Belgian group specializing in care for the elderly. It has an extensive network of nursing and care homes and assisted living facilities.